The WP Courseware integration is included starting at S3 Media Maestro version 3.2. The purpose for the integration is to prohibit the ability to complete a unit until the video(s) requirement is complete. 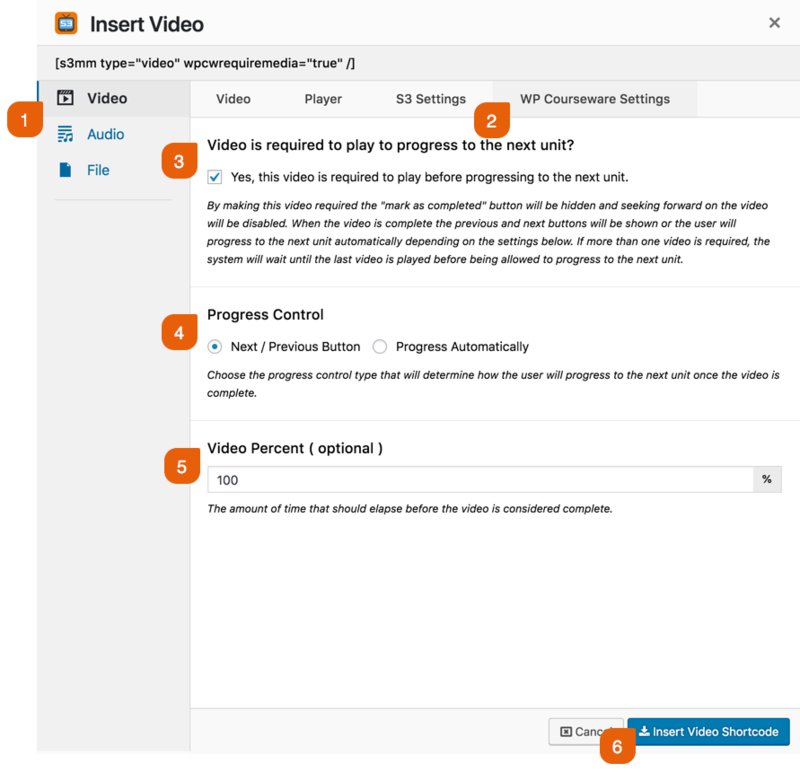 The integration directly relates to course units and can these settings will only be found in the context of the shortcode builder with in a course unit (with in the course builder, or the course unit editor screens). Also, the video requirement only relates to the video's stored on AWS S3. There are 3 easy steps to configuring the video requirement. Select which type of media you will be embedding. Select your media files to be added to the shortcode as well as any player settings. When embedding a media file to a course unit using the shortcode builder, a new WP Courseware tab will appear. Click on the WP Courseware tab. Select the Video/Audio is required to play to progress to the next unit checkbox. Select the action that should happen when the video requirement is met. Either display the Next/Previous Button to be displayed, or Progress automatically to be automatically redirected to the next unit. [Note] If you are using multiple video, or audio files, this setting will only apply to the very last media file displayed on page. The Video/Audio Percent setting is optional. This determines what percentage of the video must be watched, or what percentage of audio must be heard before the unit will be considered complete. If you are using a playlist, the video percentage applies to each video with in the playlist.